Honeybees are prone to swarming. A swarm is a big cloud of bees that have left the hive looking for a new home. This is a natural part of their reproductive behavior, however in a back yard environment designed to maximize honey output, swarms pose a problem. A couple weeks ago Robbie opened up both hives and noticed that in one there was no sign of a laying queen. Where there should have been cells filled with larvae at different stages of development there were instead empty cells. This indicates that either the queen died, or she took off with a swarm. 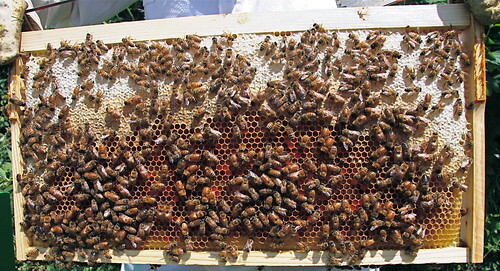 In this next photo you can see the slightly larger drone cells (where the male bees are hatched) and the very large queen cells that are perpendicular to the rest of the comb. 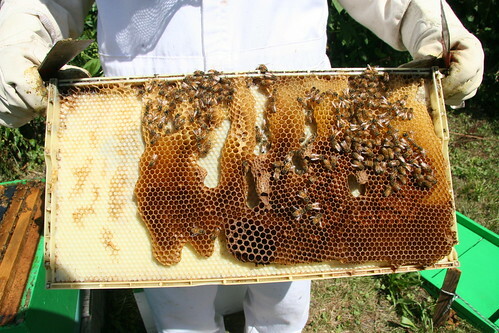 This frame is in bad shape, and all signs indicate that bees had switched to reproductive mode. Without a queen constantly hatching new workers, the hive would simply work itself to death and that would be the end of things. There were however many thousands of worker bees left in the hive, busy collecting what was left of the summer nectar flow. The solution to losing a queen is to simply get a new one. So Robbie contacted local bee expert, David, at Long Lane Honey Bee Farms and went to pick up a new queen. 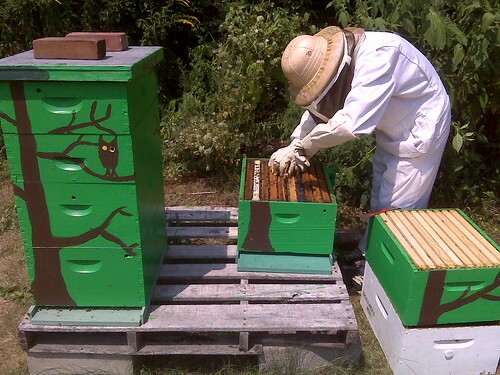 The new queen only cost about $20, and would save us the trouble of starting a new hive in the spring. You can see her long abdomen through the screen with the little green dot to make her easy to spot. The little cage that she came is designed to help her assimilate with the bees already in the hive. Her potent pheromones waft through the screen controlling the army of workers. 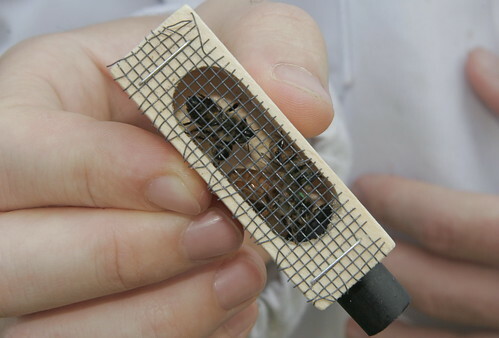 The bees then chew their way through a sugar plug (black tube thing) and release her into the hive. The delay while they work to set her free insures that she won’t just fly away once released. Robbie installed the queen cage between the two big boxes, right in the middle of the brood chamber. In a week or two we’ll open the hive back up and see if there’s any signs of egg laying. Until then, fingers crossed. J, This is a really cool article, thanks for sending it to me. The “queen cage” with the sugar door is such a cool invention, it makes so much sense. I hope it works out!